I'm back with another quick Snowball block. And you thought there was only one version of this! This block is similar to the Snowball Block Variation #1 that I showed you last week. The big difference is in the size of the corner squares with which you start. In my example, I used a 6" background square and 4 - 3" corner squares. These are bigger than the corner squares I used in my Variation #1 example. You construct this block in the same way that you made the Variation #1 block. If you haven't watched this video, no worries: you can see the entire process by clicking on the image below. I really like to use the Snowball block in either of these variations to frame fussy cut motifs. 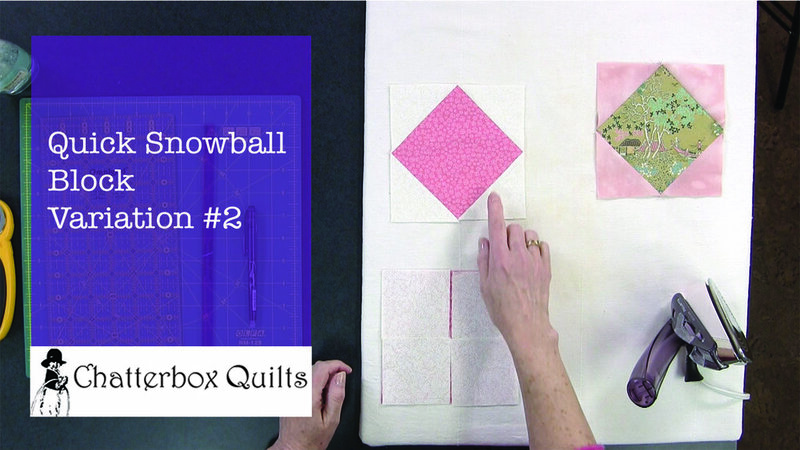 You have probably seen the Snowball block used in "I Spy" quilts, where they work perfectly due to the ease and quickness of their construction. Consider using them with specialty fabrics as I have in this tutorial. If you've made a project using Snowball blocks, email me the photo at kim@chatterboxquilts.com so I can share it with my private Chatterbox Quilts Facebook group. If you're not already a member, I'd love to have you join us in the group to talk all things quilting. Hope to see you there.